Our guided walk at Mill Creek Marsh this morning began with overcast skies, but it brightened up considerably — especially when the gull (right) agreed to serve as our guide for a little while. Although he got poor marks for his lack of articulateness, he was roundly praised for his local knowledge. Illustrations by 36 young New Jersey artists — winners of the Wetlands Institute’s annual Junior Duck Stamp Art Competition — are on display now through Saturday, Feb. 2, at the Flyway Gallery in the Meadowlands Environment Center in DeKorte Park. The Flyway Gallery exhibit includes acrylics, oils, watercolors and sketches of Hooded Mergansers, Buffleheads, Ruddies and more — ducks that can be often seen this time of year from the windows of the Flyway Gallery. The Flyway Gallery is open from 8 a.m. to 4 p.m. weekdays. Please call 201-777-2431 for weekend hours and directions. Eleven of the winning illustrations are by Bergen County artists, and tomorrow we are posting all 11 on the blog so you can enjoy them and — if you like — vote for your favorite. 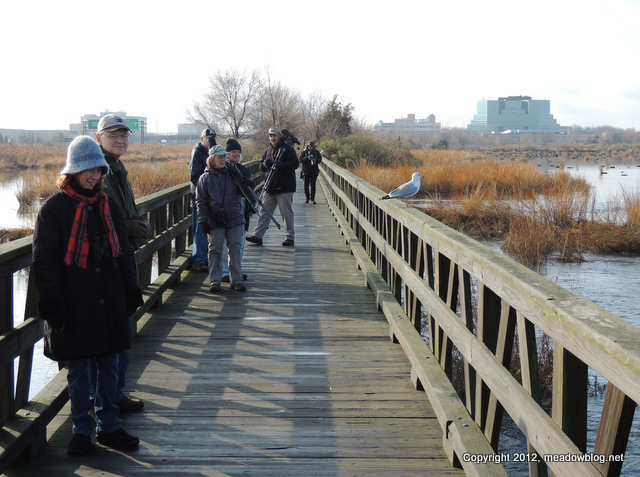 Mill Creek Marsh Guided Walk Is On But…. 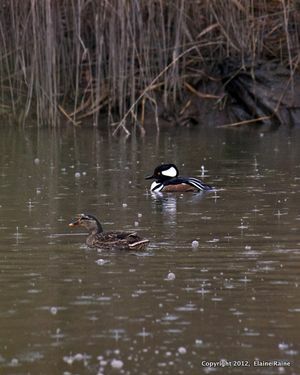 We'll give the Mill Creek Marsh walk a try today, but rain may cut it short. 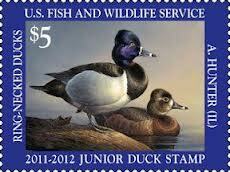 "Over the weekend and just before, there were a good number of Hooded Mergansers in the main body of water. "In addition, a fair amount of Northern Shovelers, Green-winged Teals, and Mallards were out and about. Of course, the main stay of a variety of gulls and Canada Geese occupied their regular spots. 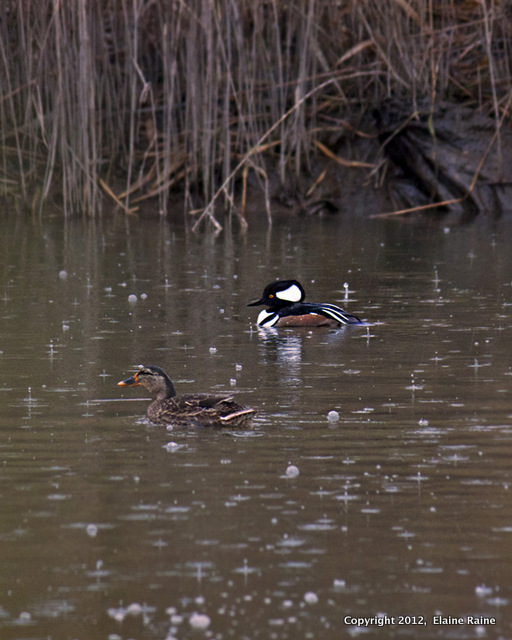 "It had been raining off and on, and the shot Elaine took of the Hooded Merganser in the wet conditions shows the raindrops." 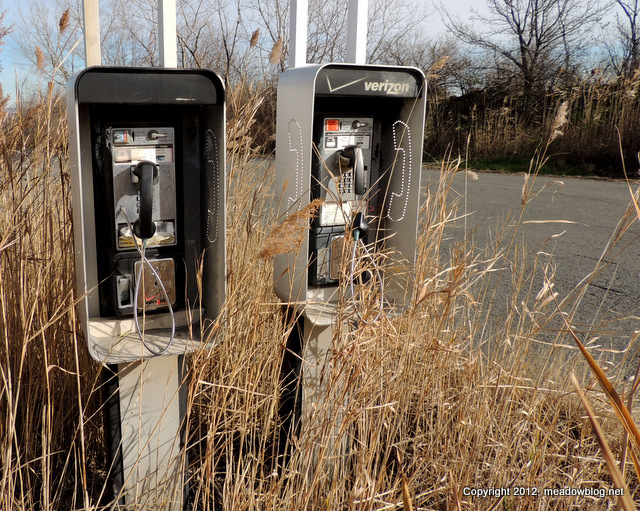 Here's a teaser for you — where in the Meadowlands are these pay phones?